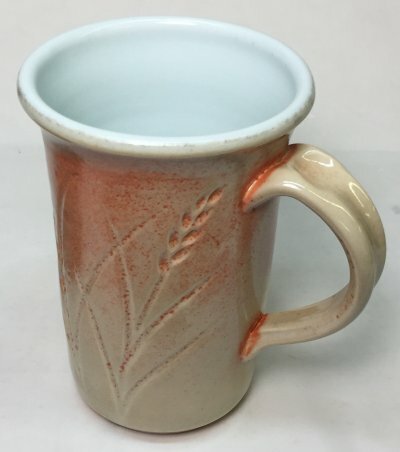 Shino glazes were developed in Japan and their aesthetics are covered on many other web sites and books. But they are described by artists using the language of art. However this page is about understanding the chemistry and the mechanisms of the color development with a view to achieving it in functional ware using modern materials and kilns. Although the term Shino has become very broad in recent years let us restrict this to the visuals of the "pearly white breaking to orange" and the carbon trapping. 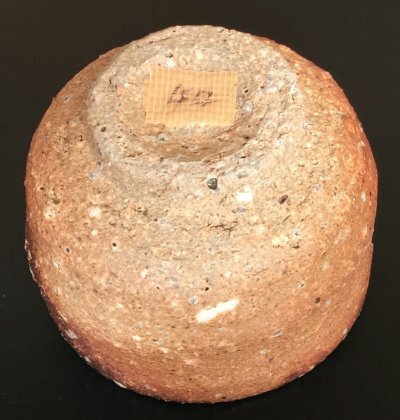 Of course, there is also a mystique surrounding the bubbling and crawling effects of many of the most loved pieces, these are also beyond this discussion (although it is known these employed a higher percentage of clay). Originally Shinos were a two-part mix of about 70-80% high-alumina, high-sodium feldspar and 20-30% clay. 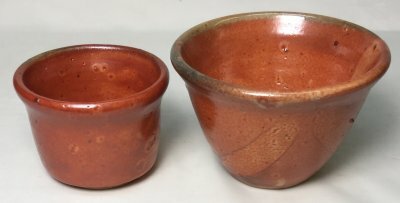 They were used on stoneware and wood-fired in reduction. Applied thickly they gave a pearly white, when thinner a red or orange. While it is claimed that the combination of high sodium and alumina produce that orange color, it seems that would not be possible without iron. In fact, it is the chemistry of the glaze that hosts the color, amplifying the color of small amounts of iron in the clay (within the glaze or in the body itself) to produce the orange color. Potters doing utilitarian pieces with the Shino effect today often want a more glossy, functional finish instead of the traditional matte surfaces (with defects). They also want something that can be put into an existing firing with other ware (e.g. cone 10 reduction). The vast majority of people simply experiment trying Shino recipes they find online rather than thinking about the chemical and firing mechanisms of the original Shino effect. Recipes can have up to a dozen ingredients. But given the simplicity of the original, it would appear that needlessly complex recipes are unnecessary (likely a product of blending of other multiple recipes). It is best to approach your search armed with a little background knowledge. In fact you might find a better approach is to simply propose a recipe, based on the conclusions drawn below, and try it (albeit without a wood kiln and all the magic it did to create the original effects). Let's do that. -A high percentage of nepheline syenite producing a very high Al2O3 level in the flux unity formula, usually higher than 1.0 going even to 2.0 (you will see this number calculated by entering the recipe into your account at insight-live.com). No other type of common glaze recipe used in ceramics has even close to this amount of Al2O3. -No added silica (and a Al2O3:SiO2 ratio usually well below 5:1). -Enough clay to suspend the glaze (these add even more Al2O3 than what is in the Nepheline). Kaolins and ball clays are used. The more alumina that can be sourced from the feldspar the more feasible it is to employ ball clay rather than kaolin (ball clay has lower Al2O3). -Low CaO (it inhibits the orange color). -Soluble sources of sodium (e.g. soda ash, salt) are often employed. This may be to simply boost the Na2O content but it is not clear why soluble sources are used (since these will migrate and concentrate at the surface during drying). It seems more likley these are intended to melt early and trap carbon (a secondary characteristic of Shino). -A small amount of an iron-bearing clay. -Often small to significant amounts of tin oxide (up to 10%, exceptionally expensive!). Why? Maybe it is there as a catalyst to develop the color of the iron. 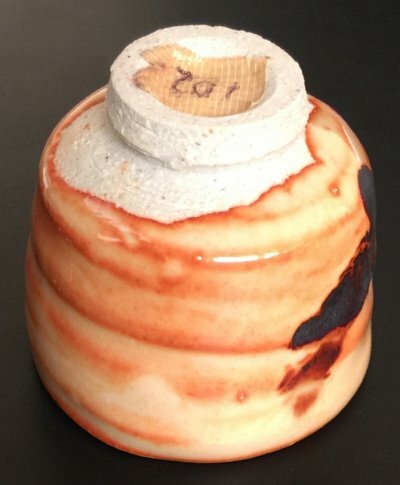 There is also a possibility the tin is opacifying to crow-bar the opaque cream effect in oxidation firing (especially where more powerful melters are being employed, ones which will make the glaze more transparent). -Super melters that source boron (from frits or Gerstley Borate), lithium (from Spodumene and lithium carbonate) and even zinc are employed in some recipes. These could be there to carbon trap or to produce a more functional surface. However some control is needed or the thick, opaque and pearly nature of the surface would be lost. These alternate fluxes also have another key effect: low thermal expansion. 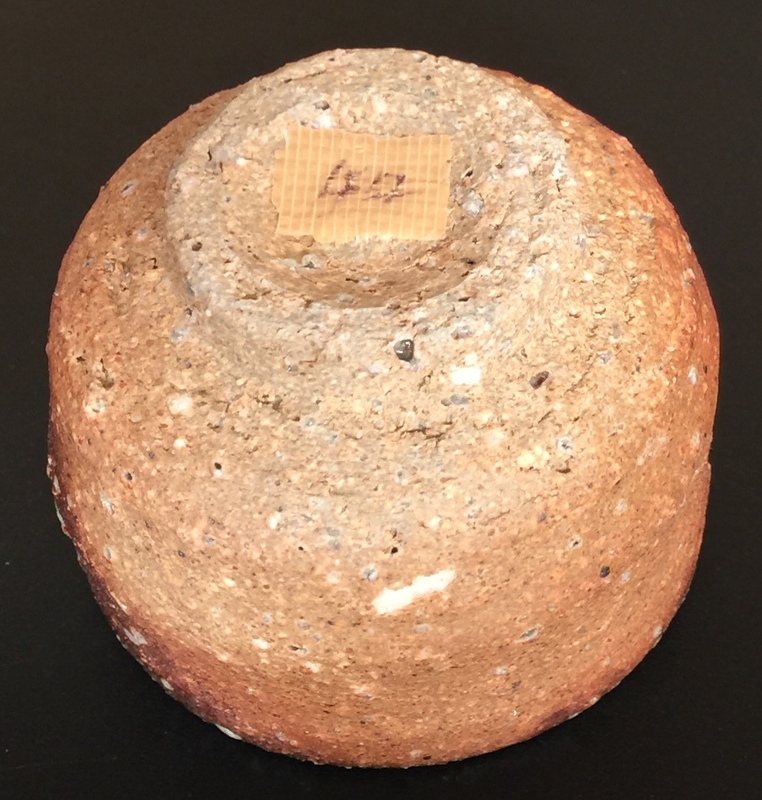 If they are employed at the cost of sodium, significant reductions in thermal expansion of the glaze would result (reducing crazing is something I find very attractive for functional ware). There are recipes claiming to be Shino that deviate completely from every guideline already given: having high silica:alumina ratios, low sodium, high iron or high CaO. As noted, some employ ridiculous percentages of tin oxide. If you are new to Shinos it might be better to stick with the simpler recipes and focus more on the techniques and the firing to achieve the effect. If you enter the recipes in your account at insight-live.com you can see the chemistry (and compare many side-by-side, especially on a wide screen monitor). As noted, look for the low Al2O3:SiO2 ratio, Al2O3 above 1.0, low CaO, high Na2O. Optionally some iron bearing clay and maybe some tin oxide. Some authors discuss the "orange flashing" effect of Shinos (as if the orange effect is on the surface, overlaying the cream background). However I have not seen this. The Shino visual seems much more basic: Orange where thin, cream where thick. 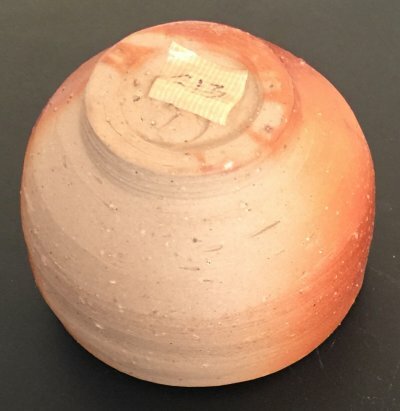 However, given the absence of an iron wash below the Shino (which would obviously produce color where the glaze is thin), there is some mystery to how the color appears to develop at the body:glaze interface (showing through where the glaze is thinner). This happens even when the body is white. How? Shinos traditionally crawl, craze, pinhole and carbon trap. These are natural products of the chemistry: pinholing and crawling because the melt is viscous, crazing because of the high sodium and carbon trapping because of early melting. While these were, and are traditionally considered decorative and pleasing, potters today are willing to minimize these in favor of producing ware that is functional. Carbon trapping is common with Shinos (likely because they cover in a thick layer and melt early before all body carbon has been volatilized). Or, the effect is simply induced by early reduction. Some claim that lower amounts of Al2O3 in the formula (below 1.0) better trap the carbon (which leaves random dark, shadowy areas in the glaze). Yet carbon trap recipes are out there with much more alumina. Of course, using low carbon bodies will eliminate this problem (if you want to). Note that carbon trapping does have implications in the functionality of the ware. Crawling can usually be dealt with effectively. Glazes with 30% clay, especially if that clay is ball clay, will shrink excessively during drying. The crack lines will then crawl during firing (especially since the Shino chemistry is high in alumina and therefore has a low melt viscosity). Simply calcining part of the clay will solve the problem. Aim for about 15-25% raw clay (the rest calcined). Pinholing can be solved by using a finer quality body (that does not generate as many gases) or by applying the glaze thinner. Or by compromising the chemistry a little to get better melt fluidity. Crazing is the most difficult issue (crazing is not desirable or even acceptable in functional ware being sold to the public). Shino glazes have high thermal expansion (although some recipes certainly are lower than others). Insight-live displays the calculated thermal expansion so you can compare quickly (these will likely calculate to the highest numbers you have ever seen!). As already noted above, a strategy to lower the expansion is to trade some of the sodium for low-expansion fluxes like lithia, zinc or boron. Another option is to use a high-silica body. It is possible to make vitreous bodies with up to 40% silica at cone 10. Such bodies are also useful for crystalline glazes (which also craze badly). Plainsman Crystal Ice is an example. The fired clay is vitreous and lightly grogged (large particles). Clay is vitreous and heavily grogged. But it is white burning. Notice the orange color is developing at the glaze/body interface and shows where the glaze is thin. This is glossier than what one would normally expect a Shino to be. This is the unglazed surface. Very heavily grogged, very large grog particles. The wax resist brushstrokes (done right after glazing) are clearly defined. This indicates that soda migration to the surface during drying is an important mechanism of the effect. Some carbon trapping is also visible on the lower section of the large bowl (and other pieces in other places in the kiln). The glaze has been applied fairly thinly so no whiter areas are visible. The color is developing despite the fact that very little iron is available from the body. I have glazed the inside of this mug with a durable liner glaze to make it functional. The porcelain contains more than 30% silica but the Shino is still crazing on it.